Chelsea are preparing a £30m offer for Real Madrid striker Gonzalo Higuain. The club are ready to move in January in a bid to boost their strike force as there is still a chance that Didier Drogba could follow Nicolas Anelka out of the Stamford Bridge door. Villas-Boas will do everything he can to hold onto Drogba but he considers 24-year old Higuain to be a perfect back-up, or even a replacement as the Ivory Coast striker gets ready to go off to the African Nations Cup with Salomon Kalou. There has been no official contact between Chelsea and Real Madrid over a possible transfer. But it is understood that the Blues have made their interest known. Higuain is apparently fed up at playing second fiddle to Karim Benzema at Madrid and being left on the sidelines by boss Jose Mourinho. 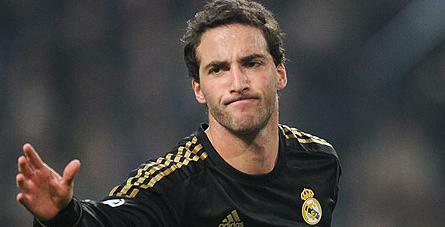 A source close to the player said: “Higuain is unhappy at being left out all of the time. He wants to fight for the title but was on the bench against Barcelona at the weekend when Real lost 3-1 and he knows where his place is now. He would be interested in what people have to say to him.” Villas-Boas had originally targeted the summer for a move for the striker, but with Anelka agreeing a move to Chinese club Shanghai Shenhua, and Drogba’s future up in the air, he has been forced to bring that forward.